Thread: Hammer + WJ spare tire well = ??? #1 Hammer + WJ spare tire well = ??? 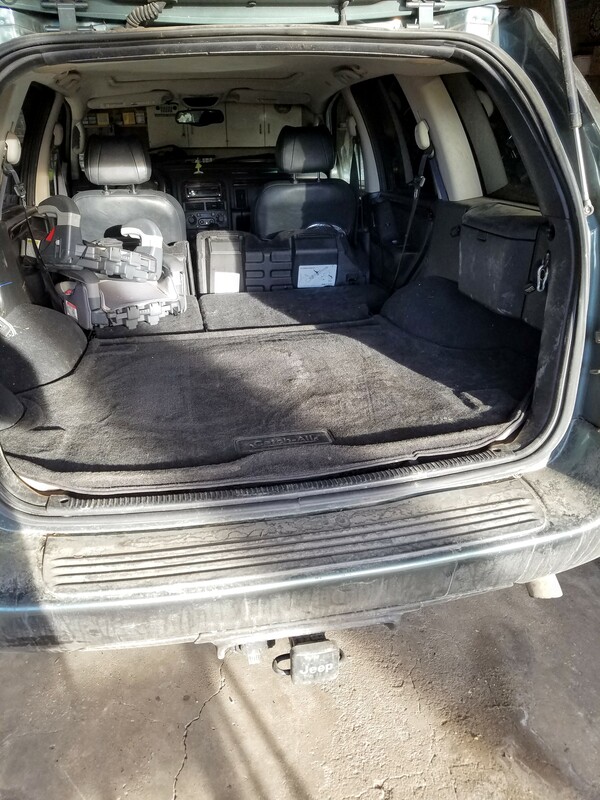 Ever since my WJ has been rolling on JL take off's, I've been annoyed that the spare has been taking up so much space in the cargo area. The new 245-75R17 was too big for the spare well. My old worn 245-70R17 had fit without issue (well documented on the interwebs as the largest size that will fit). After measuring the new tire (31.6") I had planed on cutting out the spare well and welding in a custom pocket that would fit the larger tire. But it seemed like a lot of work, especially since the new tire almost fit. So I decided to try taking a hammer to the the sheet metal of the factory spare well to see if I could stretch it just enough. Worst case, if it didn't fit I would cut it out as originally planned. After what seemed to be 1000 blows of a ball-peen hammer and even more from the 3-pound sledge, I was victorious. The new tire fits in the "modified" pocket. I might also note that my spare has zero miles on it, once I rotate the tires I expect the spare will fit better as the tread and shoulder of the tire wears down. (I'm guessing you could get a JK take-off to fit if you had a worn one to work with, the SRA's, maybe not the KM's). The spare tire now does sick up more than before, so the cover sits proud of the floor. My solution was to take some scrap wood (3/4" thick) and build up the floor around the spare cover to match the height. 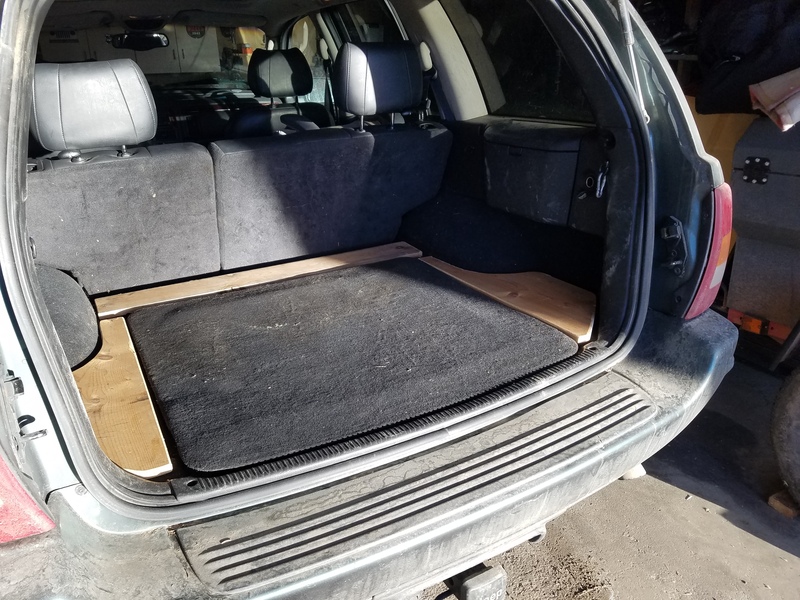 My cargo area cover sits level and you can hardly notice the difference. After the hammer, notice the vertical creases are now gone. #2 Re: Hammer + WJ spare tire well = ??? #3 Re: Hammer + WJ spare tire well = ??? I can see them. Hammer Time! #4 Re: Hammer + WJ spare tire well = ??? #5 Re: Hammer + WJ spare tire well = ??? Last edited by Ted_Z; 12-25-2018 at 12:09 AM. 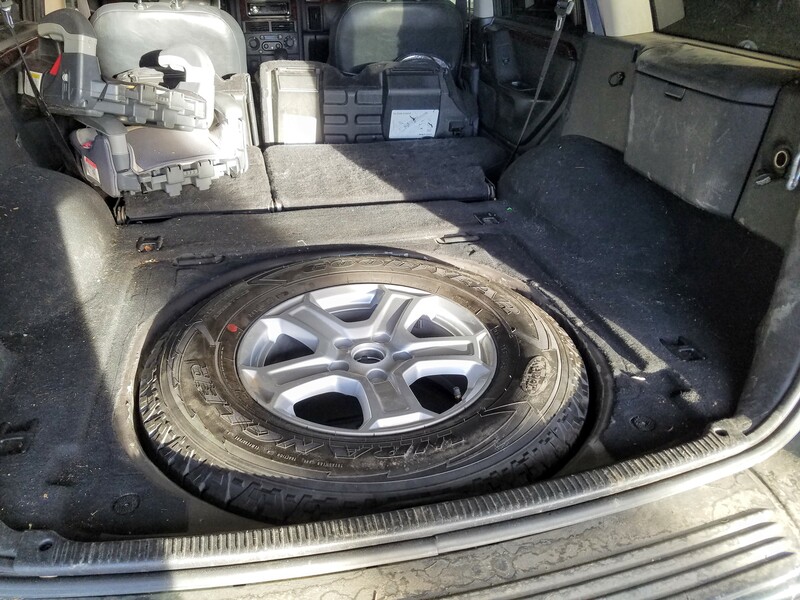 #6 Re: Hammer + WJ spare tire well = ??? Looks like a steel drum. Does it play well? Entertainment while camping? 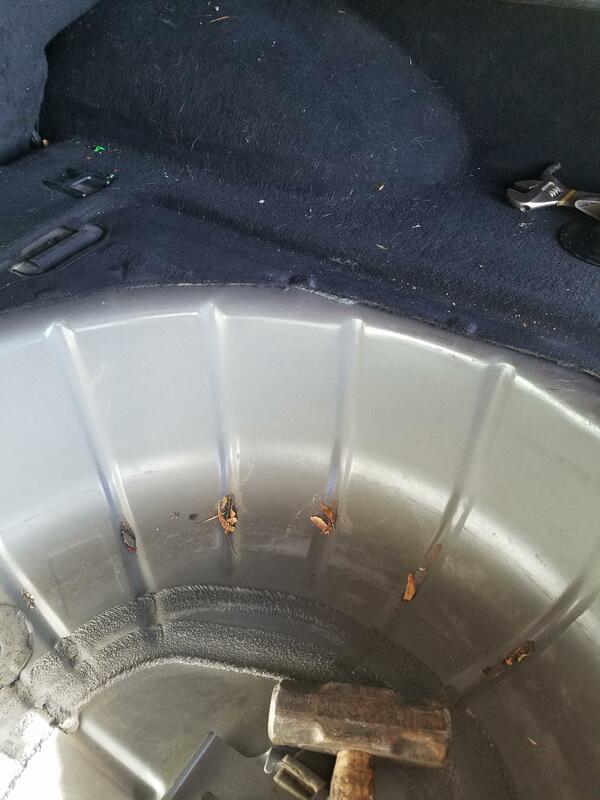 #7 Re: Hammer + WJ spare tire well = ??? I can see the second set. Thanks. Looks good. #8 Re: Hammer + WJ spare tire well = ??? #9 Re: Hammer + WJ spare tire well = ??? 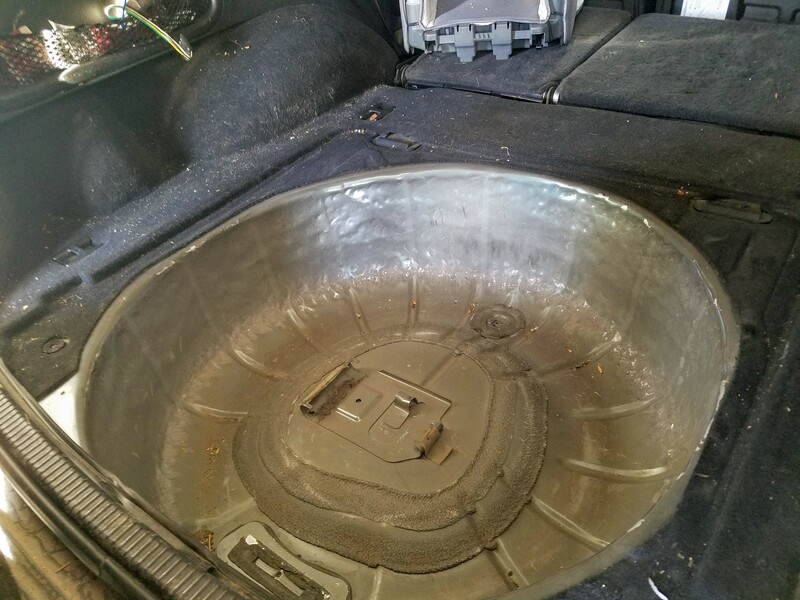 I have been running 255/75/17's from a JK and had tried to fit it in the well with no luck. I was thinking of doing the same but had forgot about it. Came across this thread and remembered. Well for the most part it fits, I had to drop the air pressure to 10 or 15...lol. Good thing I carry an air pump. Like Ted it sticks up a bit and I could cut something to take up the space but for now I could careless about that I have my trunk back. #10 Re: Hammer + WJ spare tire well = ??? That's about the biggest that fits upright in the ZJs, too. Just enough room between the seat back and the hatch. It's almost like they really wanted to put 32s on these. #11 Re: Hammer + WJ spare tire well = ??? #12 Re: Hammer + WJ spare tire well = ??? You think it could be done for a 33”? #13 Re: Hammer + WJ spare tire well = ??? Anyway I thought of something like this when I was on 32s years back, good to see it worked. My plan was make curved shims and use a hydraulic jack and press it apart. Seems the hammer idea is a better way to do it, but convinced now it would have worked. #14 Re: Hammer + WJ spare tire well = ??? I'm convinced a 33" would fit between the "rails". However, I don't think you could stretch the factory wheel well enough to make it fit. Someplace on the internet I remember seeing some one cut out the factory well, save the bottom (to conform with the gas tank shape) and make a new, larger, cylinder from sheet metal to fit a larger tire. #15 Re: Hammer + WJ spare tire well = ??? I’m not sure what route we’ll go but to keep a spare along that would be better than a bumper mount carrier imo.